In 2018, Panda Express associates and customers really showed how Panda Cares by donating $318,898 to Seattle Children’s Hospital. 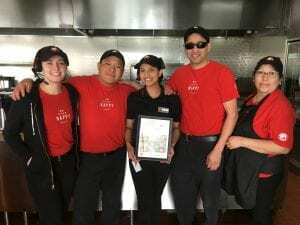 Kids and families in the Seattle-Tacoma area were helped by 39 Panda Express locations through year-round register donations by customers in each store. Panda Express employees also participate in a workplace giving campaign. A corporate partner of Children’s Miracle Network Hospitals since 2007, Panda Express has raised more than $59.3 million through a variety of fundraising activities. In 2018 alone, Panda Express customers and associates donated a total of $21.4 million and benefitted 131 Children’s Miracle Network Hospitals nationwide. The 2018 donation from Panda Express makes the company the fastest growing Children’s Miracle Network Hospitals partner – both in percentage of increase and dollar increase in giving year over year. Donate at any Panda Express register to help kids treated at Seattle Children’s Hospital. Thank you for making miracles for kids treated at our hospital! Team members at the Panda Express in Auburn, WA proudly hold a certificate recognizing their remarkable annual fundraising efforts.